Lumenpulse Inc., a leading manufacturer of high-performance architectural LED lighting solutions, has completed an innovative installation of its breakthrough Lumentalk technology, converting the Buckley Recital Hall at Massachusetts' Amherst College into a LED-powered performance space for the 21st century. The installation at Buckley Recital Hall is the first time Lumentalk has been used to modernize a multi-functional performance space. Lumentalk transforms existing electrical wiring into a smart and robust digital network, with stable, high-speed data communication. Ideal for projects where existing controls are not compatible with LED luminaires, or where the controls in place are inflexible, Lumentalk makes it possible to seamlessly upgrade to digital control and LED lighting - without intrusive re-wiring, disruptions or remodeling. "Buckley Recital Hall was using a very antiquated lighting console and control system," said Greg Campbell, Executive Vice President and CTO at Lumenpulse. "Lumentalk was the perfect solution to update their lighting system, providing a gateway to modern control advantages, without having to rip up walls or add complex infrastructure," he said. Designed by lighting design firm Horton Lees Brogden (HLB), the recital hall's versatile new LED lighting scheme has added 14 new zones of control; reduced energy consumption by 60%; and eliminated the school's annual maintenance costs, which totaled over $50,000 annually in scaffolding and lamp replacement. "Lumentalk technology allowed us to use the existing wiring and controls, which gave us a lot of options and helped us overcome challenging architecture," said Carrie Hawley, HLB Associate Principal, explaining how the technology enabled a complete yet cost-effective modernization of the space's lighting scheme. "Everything can now be dimmed, zoned, individually programmed and addressed, with a series of separate control points for the stage and the audience," she said. François-Xavier Souvay, Lumenpulse President and CEO, believes the installation could set a precedent for other theatres and performance spaces looking to add flexibility while reining in costs. "The Buckley Recital Hall shows the impact Lumentalk can have on an older building," he said. "The technology simplifies the conversion to LED lighting and smart lighting control, which apart from providing significant maintenance and energy savings, also adds untold flexibility. It can give a building a whole new lease on life," he said. Launched at Lightfair 2012, Lumentalk has been developed to work with any LED fixture, bringing instant digital control to legacy wiring systems. The technology is protocol independent, making it compatible with most traditional dimmers and control systems (Triac, 0-10V, DALI, DMX, ELV). Lumentalk received a Product Innovation Award (PIA) in March, 2012, and has since won praise from industry press and designers, including David Morgan, who has hailed the technology for taking signaling control and data transmission "to a new level of completeness for the lighting market." For more information on Lumenpulse's Lumentalk or the new Buckley Recital Hall lighting design, please visit: www.lumenpulse.com. Lumentalk™ is a breakthrough technology that enables digital control of LED lighting over existing AC power lines, maximizing cost and energy savings. With Lumentalk, electrical wiring becomes a stable, noise-free, high-speed communications link, enabling LED fixtures to be reliably controlled without additional wiring for data. The technology is protocol independent, making it compatible with common dimmer and control standards: Triac, 0-10V, DALI, DMX, ELV. Founded in 2006, Lumenpulse develops and manufactures high performance, sustainable architectural LED-based fixtures and solutions for commercial, institutional and urban environments. Lumenpulse is a leader in the LED lighting market and has earned many awards for its indoor and outdoor applications, including several Product Innovation Awards (PIA), two Next Generation Luminaires Design awards, a Red Dot Design Award and a Lightfair Innovation Award. It was also recognized as one of Profit Hot 50's Top New Growth Companies. Lumenpulse has offices worldwide with corporate headquarters in Montreal, Canada, US headquarters and Global Technology Development Center in Boston, Massachusetts, and EMEA headquarters in London, UK. 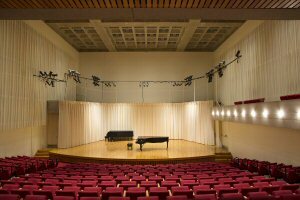 Lumenpulse's Lumentalk technology has converted the Buckley Recital Hall at Amherst College into a modern, LED-powered performance space.